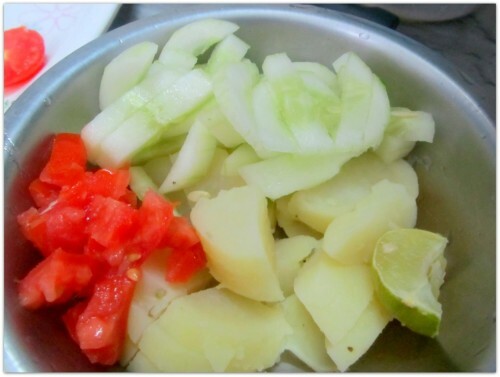 Aloo chat, an easy to make spicy and tangy short eat. We first need to boil the potatoes. To do that take some water in a pressure cooker and add some salt. Wash and cut the potatoes. The peeling can be done later. Or if you wish peel the skin before put them for cooking. 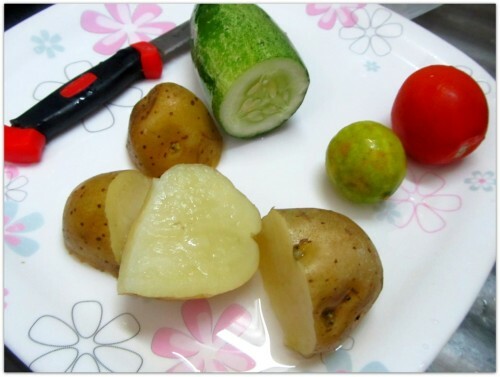 Depending on the type of potato it may take 3 to 6 whistles to cook them. When done cut them into small pieces. 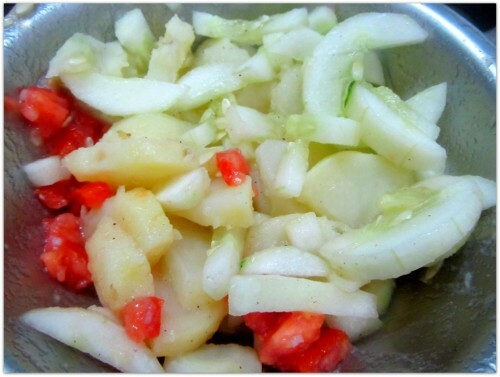 Next cut the cucumber and tomato into small pieces. Put all the ingredients in a single bowl and squeeze the lemon juice on them. Add salt and black pepper powder. Cover the bowl with a plate and shake the bowl. Your aloo chat is ready to be enjoyed. Cut all the ingredients into small pieces.